Our parent organization, the Association of Himalayan Yoga Meditation Societies International (AHYMSIN)’s website provides details regarding international retreats and workshops, programs at our affiliated ashrams in India, and special practices prescribed by Swami Veda. Visit this site to sign up for the newsletter to stay up to date with our international community. The Swami Rama Society is a nonprofit, tax-exempt organization established to support projects that foster the vision of the Himalayan sage, Swami Rama. Activities of the society include dissemination of the ageless truths and wisdom of the Himalayan sages through publications and other media as well as supporting humanitarian and educational projects that nurture the body, mind and spirit of all human beings, enabling them to lead joyful and meaningful lives. Learn about Swami Veda’s worldwide mission. Information about Swami Veda’s itinerary, the Global Full Moon schedule, and many videos, lectures, and related links can be found on this comprehensive site. Swami Rama Sadhaka Grama is the ashram established by Swami Veda located in Rishikesh, India. The name means “The Meditation Village dedicated to the teachings of Swami Rama”. Our sister center in Minneapolis, The Meditation Center, is considered by many to be the hub of Himalayan Yoga in the Midwest. The center was founded over 40 years ago by Swami Veda Bharati, who resided near and taught at the center for many years before returning to India to oversee Swami Rama Sadhaka Grama. The center’s residence and surrounding area continues to serve as home to a number of highly revered swamis and teachers in the Himalayan Tradition as well as a popular site for educational programs, celebrations and retreats throughout the year. Our other nearby sister center just north of Chicago, The Himalayan Center in Palatine, hosts classes in yoga, meditation and yoga philosophy as well as residential and nonresidential retreats and programs. Some of our most beloved guest speakers hail from this center including Anil Saigal, center president, and Diane McDonald, director of the HYMC Yoga Teachers Association. This website provides information about the Himalayan Yoga Tradition, a calendar of upcoming events, news and articles from the senior teachers in the Tradition. This site offers simple yet thorough explanations of the ancient principles and practices of Yoga and the Himalayan Tradition provided by Swami Jnaneshvara Bharati. A wealth of information to resolve unanswered questions about meditation, mantra, karma, yoga philosophy, the Yoga Sutras, Kundalini, Vedanta, Tantra, the mind and much more. The mission of the non-profit Himalayan Institute Hospital Trust (HIHT) is to provide a cost-effective, integrative system of health care that addresses the needs of the people of Northern India. HIHT brings the best of Western medicine and traditional and alternative therapies to clinical care, medical education and healthcare research, serving greater than one million people in more than 1,000 rural mountain villages through on-site and outreach programs. HIHT offers undergraduate and graduate training in Medicine, Nursing and Hospital Administration, a nationally recognized scientific research facility, specialized Cancer Research Institute, and a Seva (self-less service) Ward providing free healthcare to those in need. HIHT aims to serve as a model of complimentary and integrative medicine for the country as a whole and for underserved populations worldwide. The Swami Rama Institute of Vocational Education and Research, Malethi, India (SRIVERM) was established by Swami Hariharananda Bharati in 2005 to bring literacy and vocational and socio-economic development to the significantly underprivileged and underserved populations of Pauri Garhwal, Uttarkhand, in the Himalayas. Through the generous donations of individuals worldwide, SRIVERM provides K-8 education for children and adult education for gainful employment in Computer Technology, Electrical Wiring, Plumbing and cultivation and sale of herbal products such as rose water and Stevia. Through our parent organization, the Association of Himalayan Yoga Meditation Societies International (AHYMSIN), HYM proudly offers a training program boasting faculty from around the globe and opportunities for short or long-term study or retreat at US and international sister Himalayan Yoga Meditation centers and affiliated ashrams in Rishikesh, India. 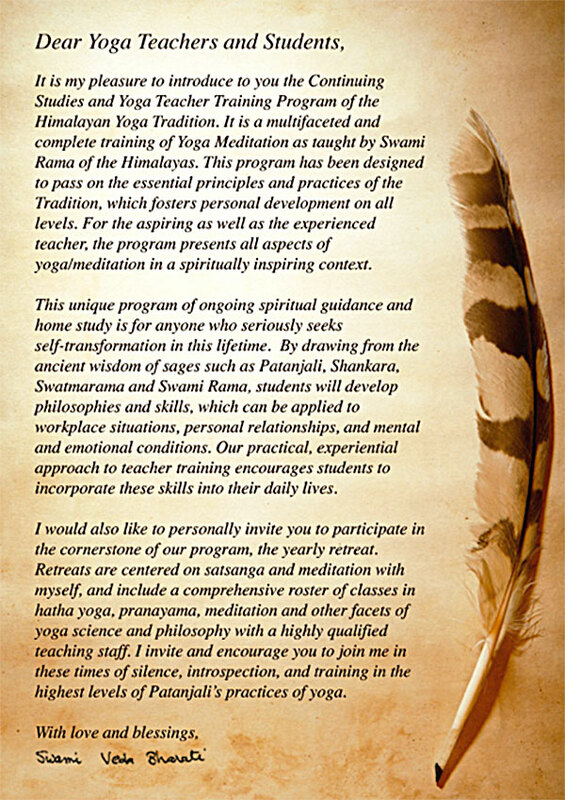 HYM offers 200 and 500 -hour Teacher Training through AHYMSIN, a Yoga Alliance-registered organization dedicated to making available the teachings of Swami Rama. Learn more at the Himalayan Yoga Tradition website.